It’s the end of the ‘sphere as we know it …. 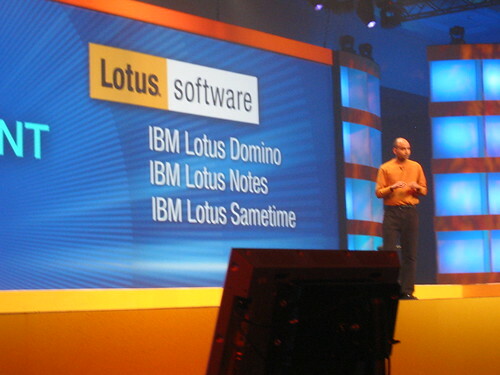 After four days of intense work, the Lotusphere 2006 comes to an end. Chris Stoner (responsible for Mail. Calendar, Sscheduling in the mail-part of Notes) and Andre Guirard (member of the Domino Designer client development team at IBM) gave a good overview on the new view-functionality in the R7 client. 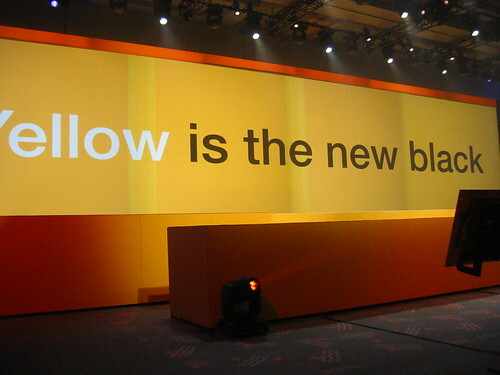 I also got to ask Andre about making the column title in views changable though @-formulas/Lotusscript. His answer was along the lines We know that this is a big issue, especially for internationalization-projects and it is on our list. I got the impression that this is coming in the near future, although they didnt mention a date or specific release. Carl Kriger and Miguel Estrada gave a good introduction to IBMs Activity Explorer thing, what the benefits are/will be and how it is implemented in IBM Workplace Collaborative Services (WCS) and Notes Hannover. Great session. It’s good to see that IBM is giving more than a nod to it’s Gurus in the community. Some nice questions, some come one, haven’t you read the documentation and some please ask this the developers questions. Great fun, will attend again next year. Now talkinyg about great sessions. This was something. 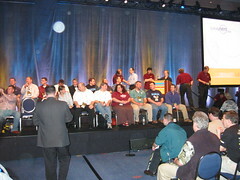 A stage full of IBM developers and an extra two rows stacked with even more developers, this was unbelivable. I have been to quite a few developer-conferences from different companies bit I have never seen such professional and willing exposure to the customer. Questions were asked in a very polite but firm manner by the audience and were take very seriously by IBM. Several IBMers were taking note. No flameing whatsoever and the audience controlled askers by booing them off, if they didn’t adhere to the groundrules. Kevin Cavanaugh oversaw his sheep and kept the session going. What I found really nice: Agent goddess Julie Kadashevich got ovations from the crowed before she could answer the one agent question that got voiced. Nice closing event, I even got a seat in the front row, due to one guy I met on the first day. Behind me Domino-Blogging-Legends like Duffbert and Libbywere seated. IBM got the crowed going by putting several bloggers comments up on the B I G screen. This raised cheers to the mentioned bloggers from the rest of the blogging-community. He got standing ovations for the repeated statement that IBM will no longer put up with FUD from Microsoft. We are committed to respond to Microsoft FUD within 24 hours. The gloves are off!, said Chana during the Lotusphere Closing Session. The rest of the day wasn’t that much fun. I had to take the shuttle bus to Downtown Disney to go shopping for the missus and the kids. Lots of money spent, but they are happy. Dinner, a few beers and a pleasent chat with two Notes-Guys from Chicago later, the day ended quite pleasently.